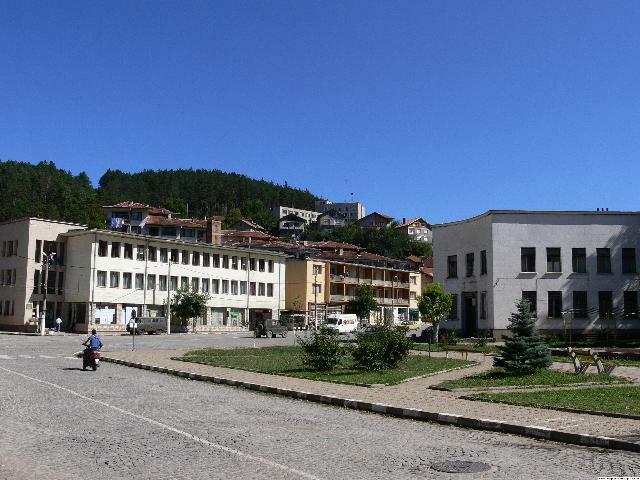 The Trun Municipality is situated in the southwestern part of Bulgaria along the state border with the Republic of Serbia and Montenegro, where there is a border control point near Strazemirovtsi village. The relief is mountainous and semi-mountainous with clearly manifested continental climate. Many mountain rivers and streams flow through the area. There are two regions with distinctive differences, namely: Znepole - a small hollow of 770 m altitude above sea level; and the mountains of Kraishte geographic region - Lubash, Kopren, Ogorelitsa, Vargaivitsa, Svredlovitsa and Karvav Kamik; these mountains are of average altitude 1,500 m above sea level. The Erma River is the biggest river in Tran Municipality. Numerous villages are situated in its valley. Trun town is located on a small terrace on the left bank of the Erma and is surrounded by mountains. The only road passing through Tran town connects it to Pernik and Sofia and to Strezemirovtsi border control point. Trun is an environmentally clean region. There are vast forest massifs, as well as mineral springs with very good drinking quality and healing properties of the water. There are excellent mountain tourism conditions in the Tran region. The most famous route is to the peak of Ruyi, the highest in the region, which discloses a wonderful view to the whole Znepole. There are very good conditions for fishing in the micro-dam nearby Yarlovtzi village. Indeed the possibilities in Tran region for the recently very popular eco, village or cultural tourism are endless.